Trains VR Builds Up a Head of Steam Model railway puzzle title Trains VR heads to Steam for HTC Vive and Oculus Rift. Earlier this month we reported that Oculus would be bringing the first playable demo of Insomniac Games’ Stormlands to PAX West in Seattle this weekend. That’s not all the company has planned for the event, though. Rift is also showcasing a handful of apps both old and new at the VR Freeplay area, including Psytec Games’ upcoming Windlands 2 (which has been under wraps since its initial announcement late last year) and new games like Seeking Dawn and Torn. There’s also the usual staples like Echo Arena, Medium, Robo Recall, Sprint Vector, Star Trek: Bridge Crew and The Unspoken. You’ll also be able to play Stormlands at Facebook’s Gaming stand during the show. Oddly, there’s no sign of Marvel: Powers United VR, which is all Oculus took to Gamescom last week. There’s plenty of talks and tournaments going on throughout the weekend, too. You can catch players facing off in Eagle Flight, Audioshield, Robo Recall and Fruit Ninja VR to name a few. As for the talking, look out for the Futures of Interactive Storytelling and Gaming While Other sessions held by Ubisoft as well as a panel from Killing Floor: Incursion developer Tripwire Interactive. PAX West kicks off tomorrow and runs through to Monday. Don’t miss out on VR if you’re going. The post Oculus Bringing Windlands 2, Seeking Dawn And More To PAX West appeared first on UploadVR. Grab a 360 Bargain as Vuze Launches 20% Back to School Discount on its VR Cameras Plus, the new Vuze XR camera will be showcased at Photokina 2018 for the first time. New Epson AR App Released For DJI Drone Pilots Introducing Epson Drone SoAR. Preview: Reef Quest – Is the Gameplay Better Down Where it’s Wetter? Continuing Spark of Light with a greater experiment on depth. Downward Spiral: Horus Station Dated for September Launch on PlayStation VR It's the second installment in the sci-fi series. Interactive VR Experience Suspension House Just Scooped A Top 3D Architecture Prize Showcasing the natural environment working with a structure. There’s one more game to add to our list of big fall releases. Marslit Games’ promising VR adventure, Unknown Fate, is coming next month. The game, which is published by 1C Company, arrives on September 6th for $14.99 with optional support for the HTC Vive on PC (Oculus Rift support is also on the way). 1C also announced today that the game is going to come with support for Tobii’s eye-tracking technology in both VR and non-VR modes. This support will add new control options to the game, allowing you to highlight objects and trigger environmental events. A new trailer for the game also debuted at Gamescom this month, which you can see below. Unknown Fate first caught out attention last year thanks to its solid visuals and intriguing art direction. It’s a first-person adventure in which players explore a twisted universe filled with fantastical creatures, many of which seem to be interested in killing you. Luckily you have a ball of glowing light in one hand that seems to put a stop to them and it also used for solving puzzles. Finally, 1C confirmed that the VR version of the game will support tracked controllers as well as gamepads (we had assumed it would only be the latter). It’s also getting a console edition, but PSVR support hasn’t yet been mentioned. Fingers crossed. The post Promising VR Adventure Unknown Fate Is Out Next Month appeared first on UploadVR. One of the first third-party applications for the Magic Leap One AR headset has been announced. 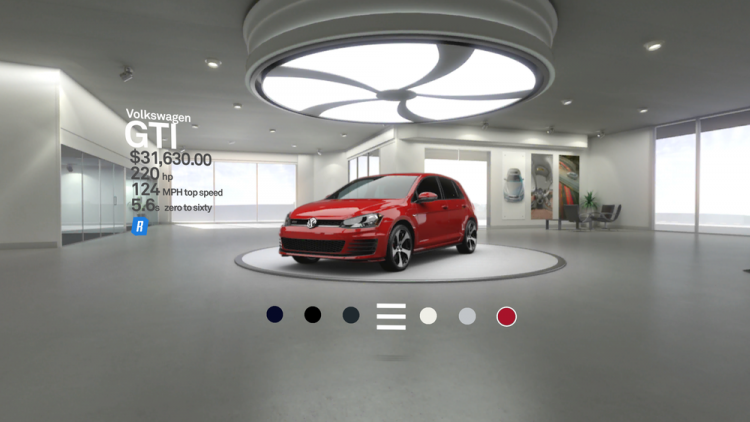 RelayCars, the virtual car viewer that’s been available on the Gear VR as well as other VR headsets for a few years now, will soon be coming to the device, which itself launched earlier this month. The app will allow users to select from a wide variety of vehicles, place a virtual image of them in their rooms and then view them in close detail, changing features like colors and even watching them drive around the given space like a virtual RC car. RelayCars is and has always been an app for car shoppers, not budding racers, so you don’t actually get to drive the vehicles for yourself (not to mention we don’t know how that would even work on Magic Leap). The idea is actually very similar to some of Magic Leap’s existing apps that allow you to pull 3D models of furniture from the web and then digitally place them in your own room as a sort of immersive ‘try before you buy’ experience. Look for the app to launch in September. Magic Leap itself isn’t a consumer headset yet, instead sold as a Creator Edition designed specifically for developers. Think of this more of a soft release ahead of the true consumer launch, then. The post VR Car Viewer RelayCars Is Heading To Magic Leap appeared first on UploadVR. Next month’s Raindance Film Festival will bring some of the best VR experiences from events like Tribeca and Sundance to London for the first time. The festival this week announced 33 different VR experiences that will be on display in the UK capital from September 26th to October 7th. Many of these include intriguing films and experimental apps that are making their UK premiere, like the next installment in the Arden’s Wake series and Crow: The Legend, which stars Oprah Winfrey and John Legend. Raindance will also play host to some all-new experiences like 7 Miracles, the feature-length VR movie being published by Vive Studios that follows Jesus throughout the book of John. The Archivist, meanwhile, is a Twin Peaks-inspired piece that has players explore a surreal mystery. We’re also excited to check out The Apple, a multi-person experience that takes viewers through various stages of life. Elsewhere there’s a selection of 360 degree video playlists that showcase the latest the medium has to offer and even a gaming section with interactive content on offer. The latter includes a look at Ubisoft’s Transference and an incredibly nope-looking VR horror game named Kobold. Each of the experiences featured in the festival is also up for the Raindance Immersive Stories Awards, covering categories like Best Immersive Story and Best Interactive Narrative Experience. The nominees will be sharing their own stories at a Summit on October 4th, while the Awards Ceremony will kick off on October 6th. Tickets to various screenings across the week are available from Raindance’s official website. The post London’s Raindance Film Festival Welcomes 33 VR Experiences Next Month appeared first on UploadVR. Bhaptics Talks About A Modular Approach to Haptics Technology Nina speaks to Stuart Burmeister of Bhaptics about the VR-integrated haptics technology he company is working on. FOIL Meets ACOS: The Future of Immersive Leisure To Run London Event At Autumn Coin-Op Show Kevin Williams brings Las Vegas expo to UK. Last year’s MR headset was considered to be on the lower end of a range of devices Microsoft introduced with the help of several companies. The OJO 500, meanwhile, builds upon it with an integrated audio system and adjustable interpupillary distance (IPD) that’s measured via an Android app. That said, don’t expect a big update in the optic department; the headset has the same 2880×1440 screen as its predecessor, still with a 90Hz refresh rate and 100-degree field of view. Microsoft’s inside-out tracking tech is still used and there are built-in microphones to boot. The most curious addition to the device, though, is the ability to actually remove the VR optics, essentially leaving just the headband in place. Why would you want to do this? Acer says it’s mainly for hygiene in location-based VR instances. An arcade, for example, could simply swap out optics as new people jump into experiences and clean the just-used kit while another clean set is being used in its place. It definitely sounds like a more convenient, if more costly, method of keeping VR clean at events. Acer hasn’t yet revealed a scheme to purchase a bulk amount of units. We also can’t help but wonder if this could mean Acer could launch future VR headsets with just the optics component in the box, quickly attaching to a user’s existing headband for an upgraded experience. It’d be a pretty smart way to keep the price down in future releases if so. Elsewhere, Acer also recently announced its next-generation StarVR headset, which is built in partnership with StarVR and aimed at location-based experiences. Acer is launching the OJO 500 in November for $399, the same price the original headset launched at. Meanwhile, Samsung is also prepping to launch its own follow-up to its first Windows MR headset in the Samsung Odyssey+. Release details on that device are still to be revealed, though. The post Acer Reveals OJO 500 Detachable Windows VR Headset appeared first on UploadVR. Researchers Use VR To Help Amputees Embody Prosthetic Limbs Researchers at École Polytechnique Fédérale de Lausanne leverage virtual reality to help with treatment. The post FireSprite Teasing Something ‘Persistence Related’ For Today appeared first on UploadVR.